◘ If you right click on a server in the Server Browser, you have the option to block the host. This is good if you find offensive server names or a host you didn’t like playing with. ◘ If you are the host and a disruptive player joins your server, you can click their name on the top right and click the Ban option. They will now be added to your Block List and will no longer be able to join your server, nor will you see any games they are hosting on the Server Browser. ◘ You can also type /help in the Game chat tab to see commands you can use via the chat. To ban a player via the chat, just type /ban NAME. ◘ If you aren’t the host but wish to add people to your block list, you can do so by adding their name and Steam ID and then clicking BLOCK to your Blocked menu. To find players’ info, go to your Steam app and click on View -> Players and view either the Current Game or Recent Games. If you remember their name, you can sort by name or by the last time you played with them. 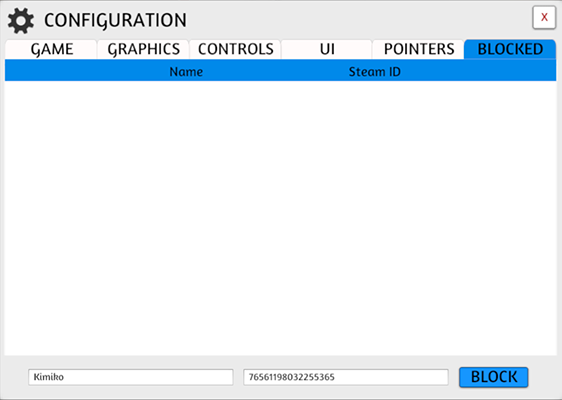 If their profile shows a username in place of numbers, you can go to any Steam ID converter to locate their Steam 64 ID. ◘ If someone from your block list joins a game you’re in or you join a server and someone you have blocked is in it, a warning message will pop up.